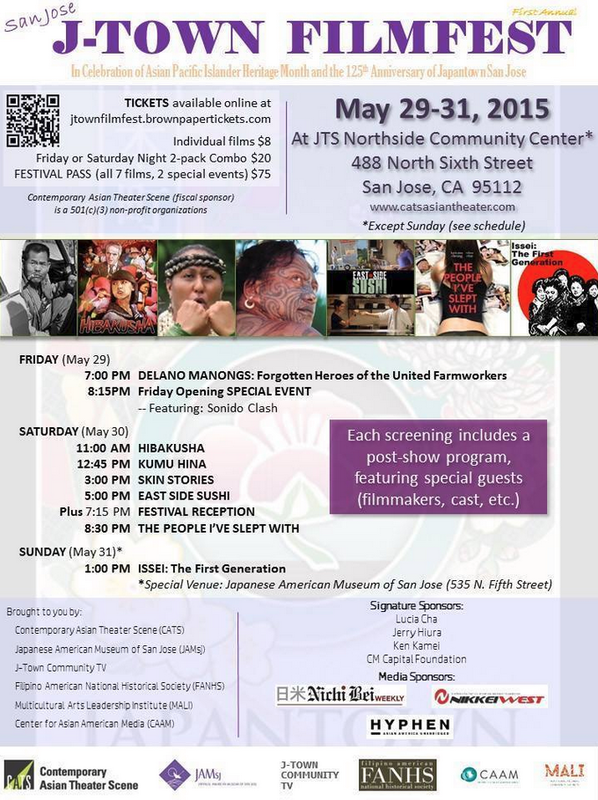 The San Jose Blog: 1st Annual San Jose J-Town Filmfest! 1st Annual San Jose J-Town Filmfest! First came Cinequest, then the San Jose Short Film Festival, and now there is a brand new festival for movie lovers. The San Jose J-Town Filmfest will run from May 29th to the 31st at the JTS Northside Community Center and the Japanese American Museum of San Jose. There will be a total of seven screenings, two special events, and multiple Q&As with the filmmakers. For more information and tickets, just head over here. Delano Manongs tells the story of farm labor organizer Larry Itliong and a group of Filipino farm workers who instigated one of the American farm labor movement's finest hours : The Delano Grape Strike of 1965 that brought about the creation of the United Farm Workers Union. After the film, there will be a discussion and reflection on the 1965 Delano Grape Strike by famed playwright/filmmaker Luis Valdez and Marissa Aroy, the film's director. 8:15pm - Special Live Music Event featuring San Jose-based group Sonido Clash. Enjoy a night of live music, dancing, and food to kick off the first night of the festival! An animated documentary/drama directed by Steve Nguyen and Choz Belen, the film centers around Kaz Suyeishi, a survivor of the atomic bombing of Hiroshima. As an older woman, she recalls her most vivid and horrific memories of the bombing when she was a student in Hiroshima. The filmmakers reached out to Mrs. Suyeishi in order to tell her story using computer animation and hand-drawn techniques. The film utilizes specialized graphic design techniques and 3-D implementation to establish the unique visual animation style. Film screening will be followed by a Q&A with director Steve Nguyen. Kumu Hina is a powerful feature docu-drama that shines light on the struggle to maintain Pacific Islander culture and values within the Westernized society of modern day Hawaiʻi. It is told through the lens of Hina Wong-Kalu, an iconic Native Hawaiian figure who is both a proud māhū (transgender woman) and an honored and respected kumu (teacher) and community leader. A special Q & A with Kumu Hina live via Skype will follow the screening of the film. Skin Stories is an anthology of stories and stunning images gathered from the hot spots of Pacific tattoo culture. The film offers an insight into how various Pacific Island cultures have reclaimed their deep ancestral heritage of tattooing. Co-Producer Emiko Omori will appear for a post-screening Q&A discussion. Winner of the Audience Award at the Cinequest and CAAMFest film festivals, this critically acclaimed film introduces us to Juana, a working-class Latina single mother struggling to make ends meet. After landing a job at a Japanese restaurant, Juana is introduced to a completely new culinary experience after observing the restaurant's sushi chefs. A reinvigorated Juana embarks on a journey to become a great sushi chef, determined not to let anyone stop her from achieving her dream. A Q&A with director Anthony Lucero will follow. Join East Side Sushi director Anthony Lucero and other special guest filmmakers for a festival reception with sushi! Karin Anna Cheung stars as a promiscuous young woman who finds herself with an unplanned pregnancy. Determined to find the father, she goes on a comical and raunchy hunt through her past hook-ups in this charming romantic comedy. There will be a post-screening Q&A discussion with screenwriter Koji Sakai and the female lead, Karin Anna Cheung, after the film. Filmed in and around Walnut Grove, this historical documentary revolves around original interviews with Issei (first generation Japanese Americans) as they recount their lives and experiences growing up in rural California before, during, and after World War II. Filmmaker Toshi Washizu will appear for a post-screening Q&A discussion.